In 1982 immediately after finishing the Novena to the Holy Spirit, the award-winning author, Patrick Dillon, had a brief vision of a woman who dramatically changed his life. On June 24, 1981 in the small village of Medjugorje, in former Yugoslavia, six children claimed Mary appeared to them eventually sharing potentially world-changing secrets including an urgent call for humanity to return back to God. The apparitions still occurring today include messages from Our Lady to the world. In May 1990 in their early 20s, with little money, God made it possible for Patrick and his sister to make a pilgrimage to Medjugorje. While there, they experienced miraculous life-changing events. More importantly, they fell in love with Jesus who showed them, through His Mother Mary, a place that welcomes all people and faiths, regardless of religious denomination or belief, the wonderful love of a Father God in the form of a Heaven on Earth. The author intimately shares his family’s triumphs and many challenges that were overcome by the power of prayer before, during, and after their Medjugorje experience. It is Patrick‘s hope that the reader will be encouraged by this remarkable journey of faith and will realize that help is here, right now! Comienza a leer Crosses, Sunsets & Sinners en tu Kindle en menos de un minuto. 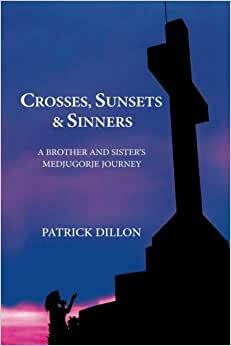 For those interested in Medjugorje or readers who are already devotees of this special place, this book is a heartfelt testimony of a trip the author took to Medjugorje nearly 30 years ago, on the eve of the Bosnian war, and not only the many experiences and graces he and his sister received then, but the continuing influence of the experience on his life and family ever since. Filled with interesting stories from the trip (including being buzzed by military helicopters and witnessing a life-changing sunset atop Cross Mountain), this book is easy to read and comes alive with the honest, passionate, humorous voice of its author. The family relationships he recounts are quite moving, especially the bond he has with his sister. Written over many years, despite continuing obstacles, this book is truly a labor of love, and a timely addition to the growing literature about Medjugorje. I am not an avid reader, but once I started reading this book, I could not put it down. While reading it I felt like I was experiencing the adventures myself. You can tell the author really done some deep research, and knew and felt what he was writing. I especially love the way his personal life, and that of his family were enter twined with the spiritual aspect. His relationship with his sister and his father brought me to tears, which is a great story in itself. If you cannot make the trip to Medjugorje there is no better way to experience it than reading this book. A truly, truly brilliant writer that writes from the heart. 5.0 de 5 estrellasMy fav book! Blessings all around while reading this book! Profound vision & wisdom. Our Blessed Virgin Mary is pleading for our salvation! How kind and loving she is. All we have to do is listen & act! Awesome read! I really LOVED this book! In fact, I want to read it again and this time underline all the important messages that made an impact on me. The author has a very sincere, honest, and witty way of getting his story told. I thoroughly enjoyed reading about his past and present life. His interpretation on Medjugorje and the messages are clear and easy to understand. This book makes you strive to be a better person! It helps you grow spiritually and opens your eyes to capture the beauty in nature, in particular the radiant colors of the sky. It also opens your heart and soul to live a better, deeper, more meaningful life by living the messages of Medjugorje. I would highly recommend this read to everyone! Oh and the bonus pics are really cool too! Super special book! I could not wait to read Crosses, Sunsets and Sinners after ordering, as I have traveled to this beautiful place many times. It was wonderful in that it gave a great mental picture of the times in the early days of Medjuorgje and yet at the same time brought the real life experiences of the author and his sister from his home in the United States, to Medjuorjge and back.